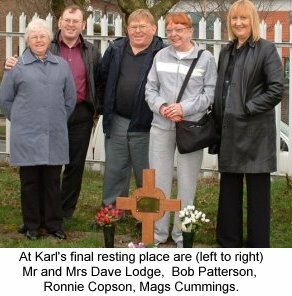 Fans of Karl Denver have contributed to a memorial at Stockport Cemetery that marks the site where his ashes are interred. If you would like to pay your respects, drive to Nangreave Rd and stop opposite St Thomas Aquinas College. There is a gap in the fencing to access the cemetery. 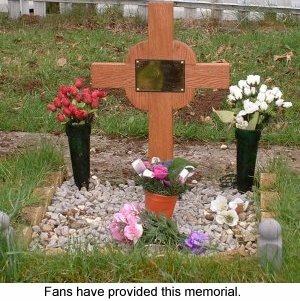 Turn immediately to the right and the grave is alongside the fence about five up. The following appreciation was published in The Guardian on New Year's Eve, 1998. Karl Denver, the yodelling pop singer best remembered for his 1961 recording of the Zulu folk song Wimoweh, died on December 21, 1998, aged 67. During the early 1960s he was a familiar figure on both radio and the concert stage, performing in what one reviewer called his "eardrum piercing, multi-octave range". Denver was born Angus McKenzie in Glasgow. He left school at 15 to join the Norwegian merchant navy. In 1951 he enlisted in the Argyll and Sutherland Highlanders and fought in the Korean war. Wounded, he practised guitar during his convalescence and developed a taste for country and folk music. After being discharged from the army he again went to sea. By this time he had set his sights on a career as a singer, and he jumped ship in the United States and made for Nashville, the centre of country and western music. Taking the stage name Karl Denver, he appeared on radio and television, and the prestigious Grand Ole Opry show, before the immigration department caught up with him and he was deported in 1959. Back in Britain he settled in Manchester, where he teamed up with Gerry Cottrell and Kevin Neill to form the Karl Denver Trio. They toured the Northern clubs and appeared on Granada Television's Band Stand. In 1961 the trio was 'discovered' by impresario Jack Good, who presented them on his television series Wham! and got them on to a national tour headed by Jess Conrad and Billy Fury. Good also negotiated a record deal with Decca and acted as producer on the series of hit singles enjoyed by the group over the next three years. This was an interregnum in British pop; after rock 'n' roll and before the Beatles. During it Karl Denver found a niche. He appealed to the curious British penchant for yodelling cowboys exemplified in the1950s by Slim Whitman, whose signature tune Indian Love Call was part of the Denver stage act. Denver himself was hailed in the New Musical Express as 'an artist with a totally different and distinctive approach'. Denver's hits included a pre-1914 Victor Schertzinger song Marcheta, an equally antique French song, A Little Love A Little Kiss, the hillbilly tune Mexicali Rose and Wimoweh. Denver claimed to have discovered the song in South Africa during his days as a seaman but it had already been a hit in the hands of American folk group The Weavers, and The Tokens had re-recorded it with new lyrics as The Lion Sleeps Tonight. The Karl Denver Trio version displayed Denver's vocal gymnastics to full effect and its success propelled the group into the upper reaches of British show business. In 1962 the Trio appeared in summer season at Great Yarmouth and the following year were given their own Light Programme show, Side by Side. Among their guests were The Beatles. There were small hits for the Trio in 1964, but their music sounded decidedly old-fashioned compared with that of the Fab Four and the numerous beat groups who now dominated the pop scene. Although The Karl Denver Trio faded from the media limelight, they continued to perform in cabaret at home and overseas. There was a brief, unexpected return to the charts in 1989 when the eccentric Happy Mondays had them guesting on their track Lazyitis and on an updated recording of Wimoweh on the fashionable Factory label. This made no impact on the psyche of the acid house generation, however, and Denver returned to the cabaret circuit. Karl Denver (Angus McKenzie), singer, born 1931; died December 21, 1998.